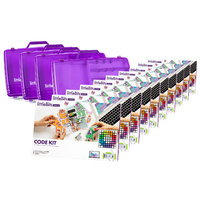 Code Kit Class Packs are bundles of the littleBits Code Kit configured for varying classroom sizes to make it easy for educators to decide which solution is right for them. Ideal for classrooms schools or districts Class Packs help educators bring coding principles to the classroom in a fun and accessible way that ties to national standards. This pack includes 8 Code Kits and 3 free littleBits tackle boxes for easy storage.